Alpha Imaging Collective member Eric Ward is known through his Instagram @littlecoal, for shooting mesmerizing landscapes all over the word, especially in the rural Midwest where he resides with his wife and three children. His eye for patterns in landscapes creates a signature look that brings a unique almost painting-like quality to the images he captures. We connected with Ward to get a look at the cameras, lenses and other gear he relies on whenever he ventures out to shoot in the great outdoors and to find out why he chooses what he does. Sony α7R III: We can all agree that this camera is amazing with its 42-megapixel high resolution, incredible dynamic range and long battery life. It's with me everywhere I go. I still love my α7R II, but I feel like the Sony team took all of the feedback that was given on that camera and raised the bar again with the α7R III. As a landscape photographer, this is my dream camera. Sony α7 III: After testing the α7 III prior to the official announcement, I was hooked. It has a lot of the features I love in my α7R III, with a crazy great price tag. The α7R III is my ultra-high res camera and the α7 III is my camera when less is more. Sony RX100V: If I need to travel super light the RX100 V is going with me in my pocket and will crush almost any situation I throw at it. I'm frequently setting it up on my GorillaPod and shooting a timelapse with the RX100 V if I'm going to be exploring an area for awhile. 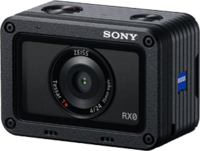 Sony RX0: If I need an ultra-portable option or if I have a shot in an incredibly tight location, the RX0 is my choice. Everyone who sees images from this camera can't believe they came from something so small. It's impressive. Sony 16-35mm f/2.8 G Master: If I'm going to be shooting landscapes or wide city scenes, this is the lens that I'm putting on my camera. On my recent trip to Big Sur for Kando Trip 2.0 I had the 16-35mm on my camera both during the day and while shooting astrophotography late into the night. 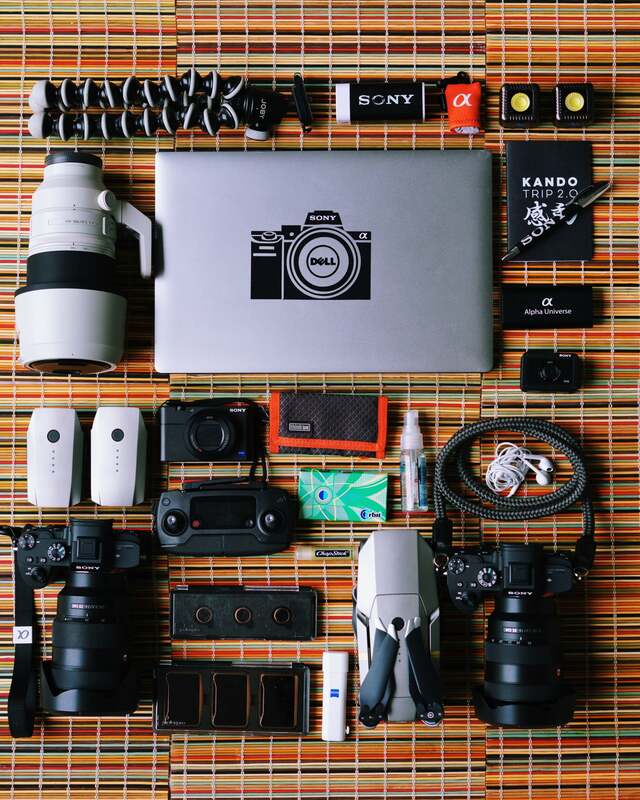 Sony 24-70mm f/2.8 G Master: The 24-70mm is my everyday lens. It's incredibly sharp across the entire frame and provides just enough reach when a need something a little more telephoto than a “normal” field of view. Sony 100-400mm f/4.5-5.6 G Master: This is the most recent addition to my lenses, but one that I've been looking forward to owning since its announcement. It proved me right recently when a friend called me over to his backyard for sunrise to photograph a family of foxes that were living in his barn. The photos I was able to capture that morning with the 100-400mm are some of my favorites. PolarPro filters: This company is producing quality filters that I use on my RX0 and my drone. They open up some interesting creative possibilities. Joby Gorillapod: Versatile and always in my bag. I especially use it for shooting timelapse with my RX100 V and for mounting a camera in an unusual spot. Lume cubes: Light where I need it when I need it. Lume cubes are really small and give me options for popping in a touch of illumination and for getting creative after dark. DJI Mavic Platinum Pro: Drones have always inspired me to imagine locations from new perspectives. My Mavic goes with me everywhere. Dell laptop: So I can edit from anywhere. Chargers: You can never have enough. Never want to be caught without power! Lens cleaner: It might seem obvious the this is a must-have for any kit to keep your glass clean and your images crisp and clear! Chapstick: I never think I'll need it and then I always do. Earbuds: I don't listen to anything when I'm outside, as the sounds of nature are all I long for. However, whenever I’m editing, I’m always listening to something. Kando Trip notebook: The perfect compact notepad to write down photo ideas, location, shooting data, project concepts. Eric Ward is a member of the Sony Alpha Imaging Collective. Follow all of their adventures on Instagram https://www.instagram.com/littlecoal/.